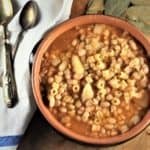 White Bean and Potato Soup is the perfect example of “cucina povera” or making do with what you have. A simple soup with incredible flavor and creamy texture makes it perfect for a winter night’s meal! White Bean and Potato Soup is one of the easiest soups you could ever make and requires only 6 ingredients. Simply flavored with onions, tomato and bay leaves, the beans and potatoes add a silky creamy texture. What else would you want on a cold winter night for dinner? I told my mother that I planned to make this soup and asked her for directions. That is when I found out that my father started making a first version of this soup with everything but the beans. The addition of the beans was actually my mother’s idea. My father did not cook often, but when he did they were always simple meals with few ingredients but quite flavorful. A perfect example is this recipe for fried tomatoes with eggs. His favorite seasonings were olive oil and salt. That’s it! No spices or fancy herbs. In fact when something was not to his liking he would complain by saying that there was neither salt, nor oil in it! Years ago my parents used to visit local farms to pick vegetables to be preserved for the winter. This included tomatoes for canning. While my father’s garden was quite plentiful, they would supplement their harvest with these trips to the Quebec countryside. Now let me tell you right here and now that this is not something I participated in. You can imagine that picking vegetables in a field did not seem very interesting to a child. They picked fresh romano or white beans still in their pod. Upon returning home they spent hours shelling these beans. I can still picture them sitting at the table or in the backyard busy with the task at hand. 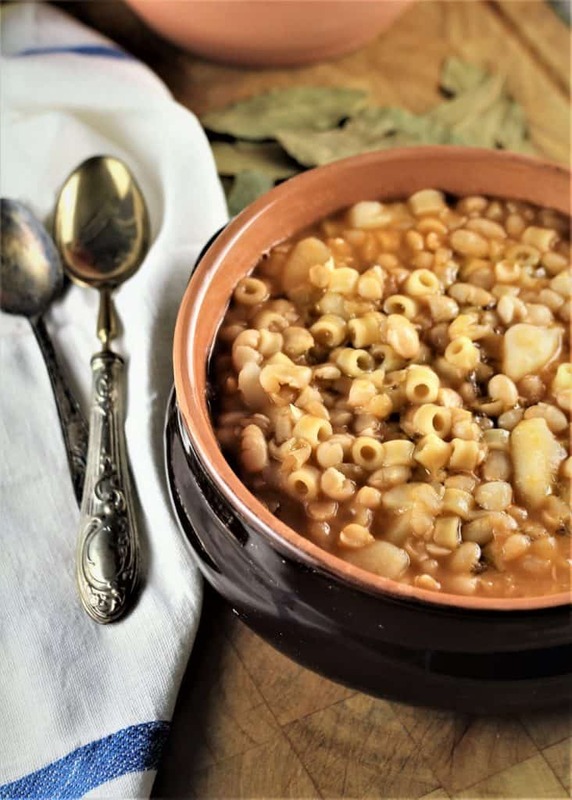 These beans, since they were fresh, were frozen and used during the fall and winter to make meals such as this soup. The amount of time and effort that went into ensuring that we had these delicious, nutritious meals to eat during the winter was incredible. We certainly knew where most of the foods we ate came from. And yet, I did not appreciate this. In fact, when I ate any dish with beans I always made a pile of them on the side of my plate. My husband suggested we visit one of these farms next summer. I wonder if my children will be interested? 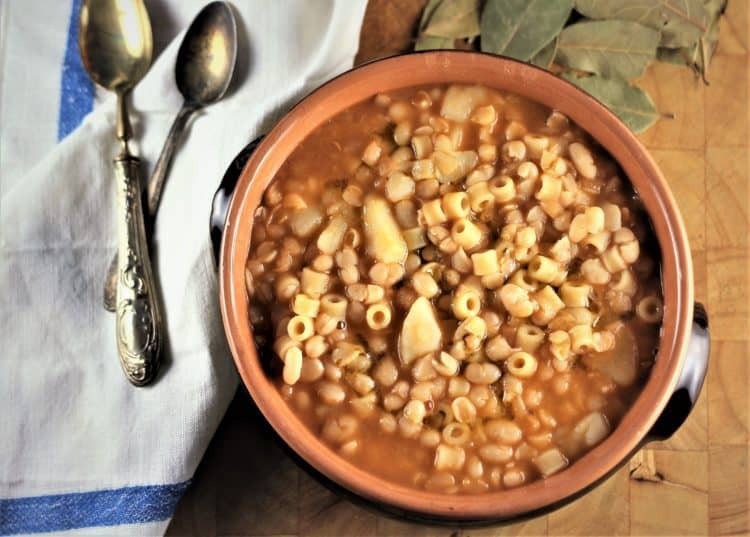 I wanted to recreate this soup but of course I don’t have a supply of these beans in my freezer. Therefore the only way to make it is with dried beans that would have to soak overnight. Which is also what my mother uses as well. Just a few easy steps and one pot for a perfect dinner! The cooking process is somewhat long (about 1 1/2 hours), however the preparation of this soup takes minutes. 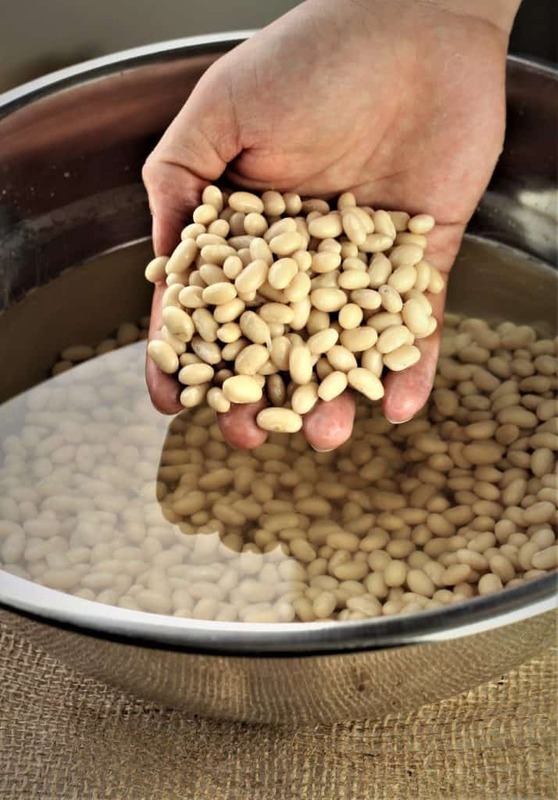 The dried beans must be soaked, completely submerged in water overnight. During this process they will have doubled in bulk and softened. In a large pot, sauté onions and diced tomatoes or tomato purée. Add water and bring to a boil. Once the water comes to a boil add bay leaves, diced potatoes and the soaked beans which have been drained of their soaking water and rinsed. Cook until tender, about 1 1/2 hours, add pasta of your choice and cook until al dente. Discard the bay leaves and drizzle with extra virgin olive oil before serving. I love this soup even more the next day. It develops an even creamier, thick texture which is hard to resist. But unfortunately when I made this batch it all disappeared the same night! White Bean and Potato Soup is the perfect winter night’s dinner! Give it a try and let me know how much you enjoyed it by tagging me with your photos with @mangiabedda or #mangiabedda on Instagram or Facebook. Don’t forget to share the recipe on social media! 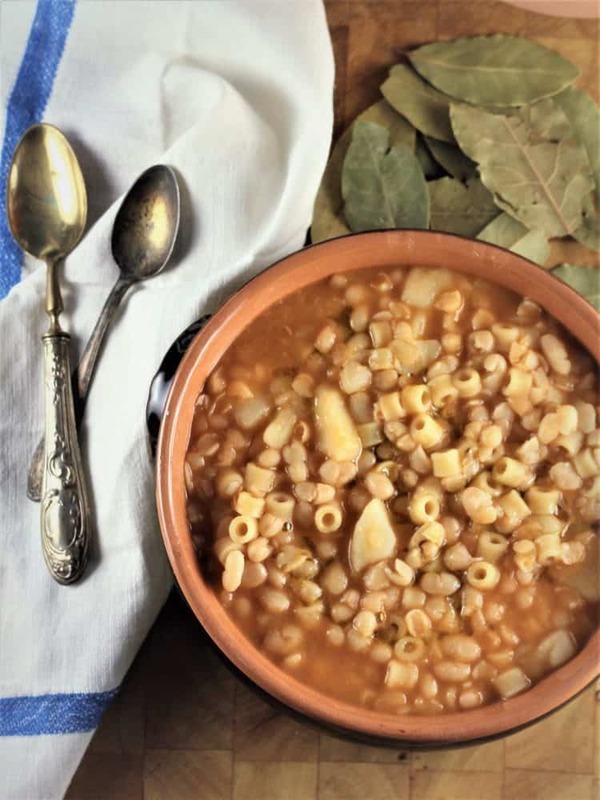 White Bean and Potato Soup is a perfect example of "cucina povera" but definitely rich in flavor and texture. The ideal winter night's dinner! 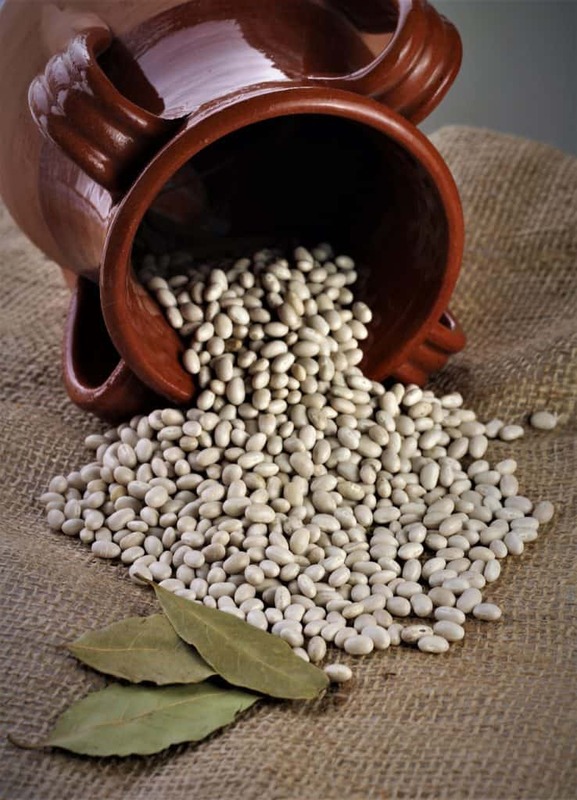 In a large bowl, cover the beans with water and let soak overnight. Heat the olive oil in a large pot over medium heat. Sauté the onions, stirring often, for about 5 minutes. Add the tomatoes and cook, stirring, for 3 minutes. Pour in 10 cups of cold water, cover and bring to a boil. When the water has come to a boil add bay leaves, diced potatoes and white beans. Bring to a simmer, cover, and cook until the beans are tender about 1 1 /2 hours. When the beans are tender add salt to taste. Add the pasta and cook until desired doneness. Adjust the seasoning, if necessary. Remove and discard the bay leaves and add a drizzle of olive oil before serving. Serve hot. This soup tastes even better reheated the next day as it thickens and becomes even creamier. If you don't have time to soak beans, canned beans will do in a pinch. Cook until the potatoes are tender, about 20 minutes. However, this may affect the texture and flavor of the soup.